The Council of Representatives is the legislative body of APA and has full power and authority over the affairs and funds of the association within the limitations set by the certificate of incorporation and the Bylaws, including the power to review, upon its own initiative, the actions of any board, committee, division or affiliated organization. Council is composed of representatives of divisions, representatives of state, provincial and territorial psychological associations (SPTAs) and the members of the Board of Directors. The Society for the Advancement of Multiculturalism and Diversity (SAMD) aims to promote a community of collaboration and open dialogue among a multitude of diverse communities and multidisciplinary professional fields toward the advancement of understanding, interconnection, and social justice. The activities of SAMD are conducted in compliance with the bylaws, policies and procedures of the Colorado Psychological Association (CPA), under the direction of the SAMD Leadership Council and, ultimately, the direction of the CPA Board and the President. The American Psychological Association (APA) developed the Disaster Response Network (DRN) so that each state organization could develop a group of trained mental health providers to serve in a variety of disaster scenarios. 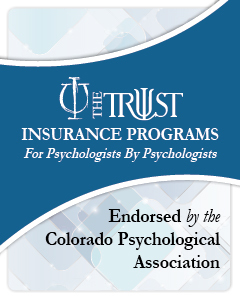 The Colorado team is made up of psychologists who have taken a free, basic one day course in disaster psychology (Foundations of Disaster Mental Health) through the American Red Cross. APA has a working agreement with the ARC and the DRN is the mechanism that connects trained providers and disaster needs. Additionally, several other disaster response groups exist in the state, so the network has expanded considerably since its inception in the mid-90s. A number of additional trainings are available. DRN members may participate in disaster work at different levels, depending on interest, availability and training, for local, state, national or (less frequently) international work. Commonly, new team members begin by serving on the ARC mental health team on call (mostly phone response) for a week at a time, several weeks a year. Other opportunities for disaster work include working with first responders, deployment for varying periods of time to shelters or to do outreach in a community anywhere in the country that has been hit by a natural disaster, supervision of new or student members, consults for phone banks, and numerous other disaster-related situations. Time commitments can vary with each individual’s availability and desire to serve. Examples of local disaster MH response include apartment fires, forest fires, winter storms, school shootings, displacement by tornadoes or floods, and possibly terrorist events. Nationally, ARC sends mental health providers to events such as the World Trade Center destruction, Hurricane Katrina, major floods and forest fires. Disaster work generally is unpaid, although sustenance and travel for out of area deployments are paid for ARC volunteers. Personal safety is assured, and DRN providers are never sent to unsecured or unsafe areas (e.g. early days of Katrina). Disasters such as Katrina often result in relocation of survivors to Denver or other cities, so major events do not always involve travel. Mental health disaster work involves short term, situation- specific responses that are classified as “psychological first aid” and do not involve extended personal relationships or psychotherapy/treatment. Training is essential, and untrained providers who show up uninvited at a disaster site are usually turned away. The DRN does not meet on a regular basis, but uses any number of communication technologies to keep in touch. Red Cross call is arranged so that team members normally need not disrupt regular working hours or obligations. There is an ARC team meeting each six weeks. A variety of trainings are often posted on the CPA website. For more information on disaster work, go to www.APAHelpCenter.org. The Federal Advocacy Coordinator (FAC) responsibilities include the dissemination of APA policy, action alerts and general information to the CPA and APA community in Colorado. The FAC attends the State Leadership Conference (SLC) each year, and leads the Colorado delegation on the hill for visits with policy makers. Policy issues germane to psychology at a federal level will be the primary responsibility of the FAC. The Psychology in the Workplace Network (PWN) is a network of more than 50 psychologists representing state, provincial and territorial psychological associations (SPTAs) and practice divisions. The PWN works to strategically position psychology in a leadership role within the marketplace by developing strong collaborative relationships with the business and employer community and educating them about the roles and value of psychology in the workplace. One representative is appointed by each SPTA or practice division. The PWN is overseen by APA’s Committee for the Advancement of Professional Practice (CAPP) and supported by the Practice Directorate’s Marketing and Business Development Department. The network meets at an annual PWN Meeting and APA Convention and uses written and electronic communication to facilitate the network’s agenda between meetings. The PWN is one of the many Practice Directorate initiatives intended to address marketplace concerns, and is intended to function for marketplace issues. Currently, the network is carrying out its mission through the vehicle of the Psychologically Healthy Workplace Program (PHWP), which includes local- and APA-level awards that recognize employers for their efforts to foster employee health and well-being, while enhancing organizational performance. Fifty-two SPTAs currently have active award programs and more than 400 organizations have been recognized with Psychologically Healthy Workplace Awards at the local-level. For more information about the Psychologically Healthy Workplace Program, visit http://www.phwa.org. If you would like to apply for the Colorado PHWP Award or participate in the BoPN activities in Colorado, please contact. An integral component of APA’s public education campaign is a large grassroots network of psychologists spanning across the U.S., Canada and the U.S. Territories. The Public Education Campaign Network (PEC) Network has always been the foundation of the campaign, providing incredible support to campaign activities on the local level through community outreach events and media interviews. Psychologists’ efforts and input are instrumental in the success of the campaign and in educating the public about the value of psychology. The face-to-face connections between psychologists and members of their communities increases awareness about practicing psychologists and the many ways psychologists help people develop skills and implement strategies for a healthier life.